Long Hunters Book Trailer from Miles Hanon on Vimeo. ​If you're a pilot or know one, read this book and support our film, it could save your life! ​If you are interested in a real thriller about Alaska flying...purchase this volume. ​Available for instant reading on your PC, tablet or phone using the ePub version see below. For Kindle order here. ​3. Open Calibre, select the product file, click "read" and start reading now! This story records the life of a young pilot flying in Alaska’s Frontier Arctic. You’ll experience the front seat thrills of bush planes and helicopters operating in the most dangerous conditions on Earth. Flying in minus 60 temperatures and horrific storms, airborne among the magnificent mountains, glaciers and rivers that only Alaska has to offer. Once you've read this volume you’ll not be satisfied until you visit Alaska yourself! Includes true-life experiences of accidents, comradeship, humor, heartbreaks and life in Frontier Alaska, gone forever when dismantled into parks and native lands in the 1970’s. Filming on location commences October 1, 2018. Long Hunters opens with an interesting and well researched early history of the 49th State, leading to the eventual use and development of a new tool of transport – the single engine airplane, but not without extracting a terrible price. Experience what it was like to growing up among the dangerous game, hunting the massive caribou herds and absorbing the greatness of the county in the 60's. Pilots will gain from the flying experiences related, includes a new appendix with life saving operational notes on pass and mountain weather flying found nowhere else plus many important links for Alaska flying. Every boy, man and aviator won't be able to put this one down, and more importantly, be compelled to grapple with its final truth, concluding with a crisis encounter that forever changed the pilot's life. 178 pages. Over 30 illustrations. ​Director/Filmmaker Miles Hannon sign on to Long Hunters production. Director Miles Hannon and Executive Producer Tim Mahoney of Patterns of Evidence are teamed on this great project, sure to thrill millions and challenge all to consider the realities & experiences related in the title.. Updates weekly! We've been collaborating with a number of great folks on the book-to-movie project, likely going to be called Alaska Long Hunters. This exciting project is moving forward and we need your prayer support. We are preparing a Maule aircraft as I write this (we have a Lama helicopter) that's the same model type fixed wing I used throughout the period. Lots of fun as we await the weather to break to resume filming on site in Alaska! Attended Proclaim 19 NRB last week and made some amazing connections with the film media. So encouraging! Maybe also a few breakthroughs relating to collaborations and partnerships! Will report more in April..
We pitched Long Hunters to a number of interested Hollywood filmmakers the week of Oct 15th. Want to read your copy immediately? Use this FREE ePub reader from Calibre, download the ePub vision from our STORE and start your journey right now! 3. Open Calibre, select the book of your choice in the downloaded file, select View in Calibre and enjoy your new title! Remember, all digital versions, ePub and Kindle include live links! "From the beginning, this book draws you into a great adventure. You easily and vividly imagine you are a part of it, and it’s hard to put it down until you have completed the journey. Part history book, adventure story, and survival manual, Last of the Long Hunters combines real-life experiences whose contents, if gleaned well, could save your life in more ways than one. This is one to read over and over again." 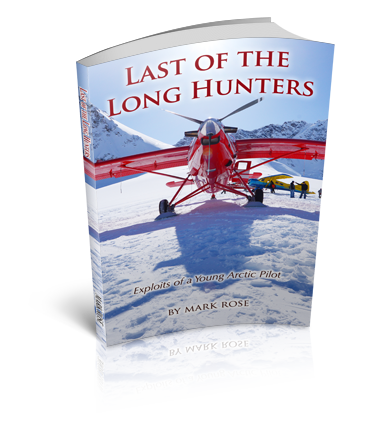 "Last of the Long Hunters is an excellent read for a short history of Alaska flying and what we often experienced. Mark and I worked together for years on the North Slope and elsewhere in the state. He has covered the adventure of flying and documented the many mistakes that were made and the lessons that were learned. Since aviation was a new industry there, our forerunners had to learn the limits of their machines and the human limits. We learned how to listen to our machines, watch the weather, and respect the inner voice that questions what we do. Further, planning ahead for any unforeseen changes was a must. Staying informed and using the FAA rules also helped us stay safe. My military experience and training before I came to Alaska paved the way for a successful career. I am looking forward to his next book, which focuses on helicopters in Alaska." Editor’s note: Mr. Wigen has thirty-seven years of Alaska flying experience and has logged more than 26,000 flying hours. "Thank you for such an interesting read. I find this book so fascinating. This book makes me regret not having visited Alaska when it would have been easier to do so. There is so much about your book that I like, and it seems to me that you have effectively pulled together the history of Alaskan aviation with your own story that it makes compelling reading. I kept thinking that this book must be a special blessing to your kids, not just because Dad has written a fascinating book, but because through this book they can know a side of you that they might not get to know any other way. I was fascinated to work my way through this information. Everything from the “rules of” to the check list to how certain equipment actually saved lives in a crash situation, this section was like a compelling exercise for my brain." "I highly recommend this book! This is a fantastic read with a big payoff. This is a great read for anyone who loves history, aviation, hunting and true life stories. We've all enjoyed hearing those unbelievable stories growing up, around a campfire or the dinner table. Those stories that have you on the edge of your seat and the ones that create heroes. This book is an incredible story and a true story the author lived through and changed his life forever. In addition I enjoyed the setup with the history of Alaska, his growing up in Alaska, the visual journey the author takes you through heading into the vast unknown of the Alaska territory. I'm not a pilot but I found myself following the author's routine and there are a lot of tips in the appendix of the book that are his notes to other pilots where he is wanting to pass his wisdom along. Looking forward to reading more from the author! Would make a great movie!" "I absolutely loved this book and recommend it to anyone who wants a front seat to the real adventures of the Alaskan pilots! It's very well written and a GREAT read!" ​Want to read your copy immediately? Use this FREE ePub reader from Calibre, download the ePub vision from our STORE and start your journey right now! 3. Open Calibre, select the book of your choice in the downloaded file, select View in Calibre and enjoy your new title! Includes dozens of live links! Whiston's "The Comet" - known and studied by Newton with it's 575 year cycle as a possible Flood causative: a comet and Flood that modernists deny..they won't even name it...! Human remains found globally. The Author uncovered an 1830's quote by the French warning the worlds geologists that a departure from the Flood account is now untenable, this proclamation due to the fact that they had unearthed so many finds of people with food stores in caves, these subsequently invaded by the mega-fauna (mammoths, tigers, bears etc..) that it would be foolish to pursue other naturalistic explanations, e.g. that these items migrated into place by burrowing animals. (The explanation given in modern archaeology texts). Trinity Broadcasting Network interviewed author Mark Rose! "I felt compelled to let you know how much I am enjoying reading the book, “The Noah Code” by Mark D. Rose….It is one of the best books I have ever read, so well written, so full of amazing history, facts and information. The description of the animals arriving to enter the Ark filled me with tears at the sheer magnificence of the Lord. It has helped to bolster my faith with the undeniable evidence that has been before our eyes all along. THANK YOU for such a wonderful book. I want to share it with family and friends. Please convey my appreciation to the author. "Blessings"
Mark Rose has worked above and beneath the Earth for over 40 years. He has traveled around the world working in some of the largest underground mines and earlier career flying in Alaska proved to him one thing: That the earth in the too not distant past experienced a grand cataclysm, a cataclysm that's been largely ignored by institutional science. In The Noah Code he sets the record straight with a straight forward and well researched approach. Rose is a patent holding inventor/engineer, geology researcher and commercial Pilot. Order The Noah Code Today! "No real evolutionist, whether gradualist or punctuationalist, uses the fossil record in favor of the theory of evolution as opposed to special creation"
All NEW Version! Last of the Long Hunters is the greatest Alaska hunting/flying story ever told! If you like adventure and could use encouragement about the existence of God, then this book is for you! See reviews on home page. ORDER THE LONG HUNTERS HERE! Well Mr. Mayer, you loose..
See more here at: The Question of Human Origins - Genesis Alive! © 2017 Genesis Alive. All rights reserved.